The Terrasolid design library is provided as an example of some of the customization that can be done in MicroStation CONNECT edition to make working with the Terrasolid products easier and more efficient, particularly for new users. We recommend the provided Terrasolid.DGNLIB remains as provided so that you can easily download the latest from this knowledge base post for fixes and new tools. Then create your own company.DGNLIB for inclusion of desired workflows or modify the existing ones in your personal.DGNLIB. For more information on how to customize CONNECT for your Terrasolid workflow see A Quick Intro to Customizing MicroStation CONNECT. Open MicroStation and you should now have the Terrasolid toolbars for each product setup as ribbon workflows in the drop-down list in the upper left side of the MicroStation window. Also, the Terrasolid.DGNLIB can be placed on a location other than these default locations on the C Drive, such as a network location, but you have to modify the configuration so that the Bentley package knows where to look. In the Bentley package, such as MicroStation CONNECT, MicroStation->File->Settings->Configuration->Configuration Variables. In this window, select the “All” Category and search for the following: “MS_DGNLIBLIST”. 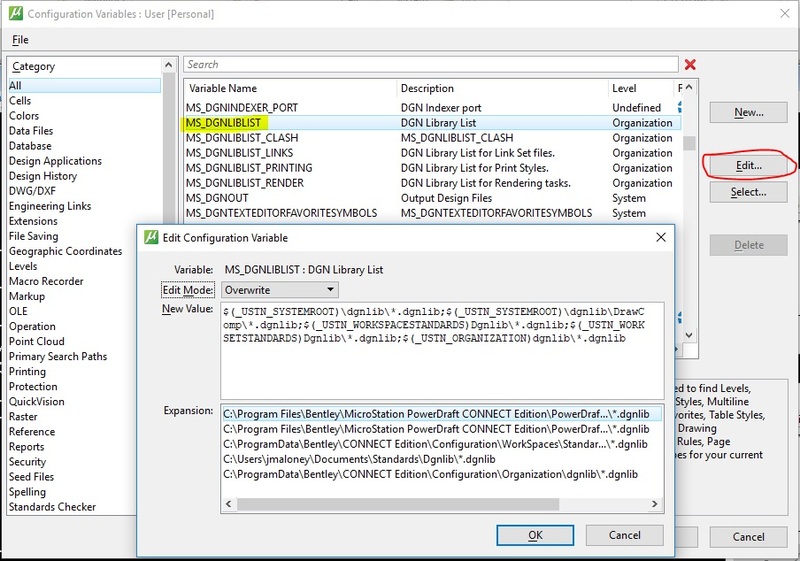 Press the Edit button and this will open the Edit Configuration Variable dialog that lists all of the locations that MicroStation searches for design file library files. Add the new desired path and select OK. This entry was posted in Terrasolid Tools, Tips and Workflows.